I love artichokes and they seem to be an ingredient that is not largely a staple in American cooking. Therefore, when you serve them to your guests it seems like an extra special treat. You know how I love frozen puff pastry for easy and sophisticated freezer items and this recipe is no different. Easy, impressive and delicious! And wouldn't these be perfect for your upcoming New Years Eve party? I think so. - In medium bowl, combine artichoke hearts, mayonnaise, garlic, Parmesan cheese and parsley; set aside. 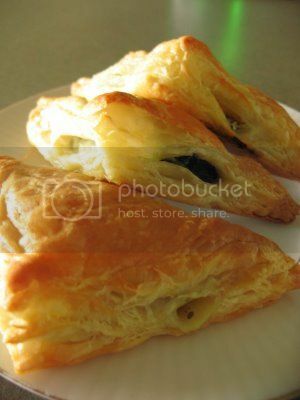 - On floured surface, unfold sheet of puff pastry. Crimp seams with fingertips. Roll sheet to 12-inch square. Brush with egg wash.
- Cut pastry sheet into 16 (3-inch) squares. Place small amount of artichoke filling in center of each 3-inch square. Fold 2 side corners up to encase filling. - Place canapes on parchment-lined baking sheet. Brush each with egg wash mixture. Repeat with puff pastry sheet and remaining filling. - Cover with plastic wrap and flash freeze. Remove from sheet pan and place carefully in gallon ziplock bag until ready to cook. Take straight from freezer and place on ungreased cookie sheet. Bake in 400 degree F oven for 13-15 minutes or until browned and puffed. Serve warm or at room temperature. ohhh.. now I am hungry. Definitely serviing these for our NYE party!